An early, rarely seen, wall map of North America. A New Map of North America with the West India Islands, divided according to the Preliminary Articles of Peace, Singed at Versailles, 20, jan 1783, wherein are particularly Distinguished The United States, and the Several Provinces, Governments & ca which Compose the British Dominions, Laid down according to the Latest Surveys, and Corrected from teh Original Materials of Goverr. Pownall, Membr. of Parlimt. An extraordinary monumentally proportioned 1794 map of North American by Governor Pownell. 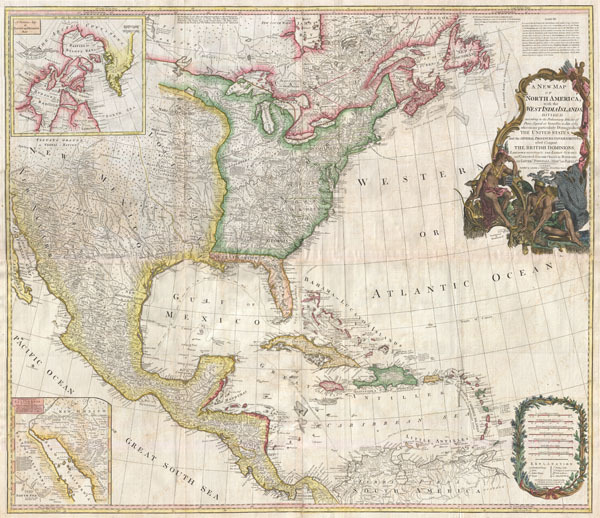 Issued shortly after the end of the American Revolutionary War, this map details the newly formed United States, the British dominions in Canada, the French territory of Louisiana, the West Indies, and Spanish holdings in Mexico, Florida, and Central America. As one might expect from a map of this size the detail throughout is extraordinary. All text is in English. We begin our examination of this map in the newly formed post colonial United States. The United States at this time extended from the Pacific to the Mississippi River and from Georgia to the Great Lakes and Maine. The early state boundaries roughly conform to their original colonial charters. Virginia, North Carolina, and South Carolina are drawn with indefinite western borders, suggesting claims to further unexplored land beyond the Appellation Mountains. By this time most of the boundary issues in the New England states had been resolved, though there remained some vagaries regarding the Massachusetts Connecticut border and, though Vermont is noted textually, its boundaries are not drawn in. At this time there were also some unresolved issues regarding the national borders between Maine and Nova Scotia. In Pennsylvania, the western border displays some surveying confusions that would not be resolved until the early 1800s and the creation of Ohio. Just to the west of these missions we begin to enter more mythical territory and both Cibola and Teguayo are noted. Cibola and Teguayo are both associated with the legendary Seven Cities of Gold. It was believed that in 1150 when Merida, Spain, was conquered by Moors ,the city's seven bishops fled to unknown lands taking with them much of the city's riches. Each Bishop supposedly founded a great city in a far away place. With the discovery of the New World and the fabulous riches plundered by Cortez and Pizarro, the Seven Cities became associated with New World legends. Coronado, hearing tales of the paradise-like mythical Aztec homeland of Azatlan somewhere to the north of Mexico , determined to hunt for these cities in what is today the American southwest. In time indigenous legends of rich and prosperous lands became attached to the seven cities. Two of these appear on our map - Cibola and Teguayo. The second inset of interest in located in the lower left quadrant. This smaller maps depicts the northern parts of the Gulf of California and the Colorado River Delta based upon the explorations of the Jesuit Father Eusebius Francis Kino. The actual cartography of this region has been vague since the mid 17th century when it was postulated that California must be an Island. It was not until Kino's historic expedition, recorded here, that Baja California was conclusively proven to be a peninsula. A magnificent title cartouche appears in the upper right quadrant. The cartouche, which angles around Bermuda, depicts two stylized American Indians surrounded by the presumed flora and fauna of the new world. These include a small monkey, a parrot, and a jaguar. Above the cartouche is a textual quotation from Article III of the Treaty of Paris, affirming the rights of the United States to access the rich cod fields of Newfoundland's Grand Banks. This map is heavily based on a map originally drawn c. 1855 by Bowen and Gibson. It went through numerous revisions and reissues over the subsequent 50 years reflecting new discoveries and the changing political climate. Prepared by Governor Pownall and published by Laurie & Whittle in Kitchin's 1894 General Atlas. Thomas Pownall (1722 - February 5, 1805) was a British scholar, statesman and soldier active in the colonial administration of North America just prior to the American Revolutionary War. Pownell was born in England and educated at Trinity College, Cambridge. After graduation he was employed by his brother, John Pownall, at the office of the Lord's Commissioners of Trade and Plantations, which oversaw British economic interests in its North American colonies. In 1753, Pownall was appointed secretary to the governor of New York, Sir Danvers Osborne. Osborne, himself having be only recently appointed to the position, committed suicide shortly after taking office. Despite this setback, Pownall remained in America and devoted himself to studying and researching the colonies. In the process Pownall became close lifelong friends with Benjamin and other New World luminaries. He also published several notable works on the colonial administration of North America. In 1757 Pownall was appointed Governor of the Massachusetts Bay colony. In this position he frequently found himself at odds with the restrictive policies of the Board of Trade. It was not long before he was pushed out of office and, declining the governorship of Jamaica, reassigned to South Carolina. Despite nominally holding the governorship of South Carolina, Pownall never visited the colony. Instead he returned to England where he eventually became a member of Parliament. In Parliament, he advocated for reduced taxes towards the colonies - had he been heeded, the American Revolution may have never happened. Pownall retired from public life around 1780, but continued to pursue his scholarly interests. Pownall's research contributed significantly to several important maps and scholarly work on North America. Very good condition. Original centerfold. Blank on verso. Original platemark visible. Wide clean margins. Light offsetting. Four sheets joined. Rumsey, 0411.040, 0411.041, 0411.042. Stevens, H. N. & Tree, R., 'Comparative Cartography', Map Collectors Circle, no. 39, 1967. 49, 1794 k. Lowrey, W., The Lowery Collection: A Descriptive List of Maps of the Spanish Possessions within the Present Limits of the United States, 1502 - 1820, 657. Library of Congress, Map Division, G3300 1783 .P6 Vault.